The Industry's only Cast Iron Electrodeposition Coated direct replacement exhaust products. For Volvo Small V8, 305cid and 350cid, marine engines. 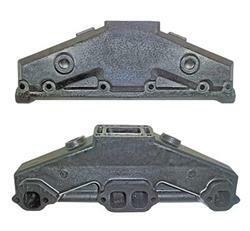 This part replaces OEM p/n's 3852374-2 & 3857723. Includes mounting gasket. This manifold has threaded holes on each end that are intended to have fittings installed into for connecting the water hoses. **For 1994 - 1997 Small V8 engines, if you are replacing an exhaust manifold with cast water hose connector bibs, you must use a special water hose fitting (#104052-stftgs). **For 1997 & Newer Small V8 engines, if you are replacing an exhaust manifold with a 90 degree inlet water fitting for the hose connector AND need a replacement 90 degree fiting order this part fitting (#104052-90ftgs).